Bell was "so close" to reporting to the Steelers during the season but knew that if he got hurt he "would have felt sick." The Steelers will try to put an end to their three-game losing streak with the spectre of Tom Brady and the Patriots due up on Sunday. The Lions perhaps could have changed the direction of the franchise had they chosen Aaron Donald in the first round in 2014 instead of Eric Ebron. The Steelers have partnered with a company that brings a video game aspect to gym-based exercise, and the players have taken a liking to it. Ten months after a spinal injury, Ryan Shazier is preparing for a Bengals rematch -- as a coach who has game footage ready to go at 7:30 a.m. sharp. AFC North Q&A: Who will win the division? The Steelers should maintain their perch atop the AFC North thanks to their offense, while the Ravens could manage to snag a wild-card berth. 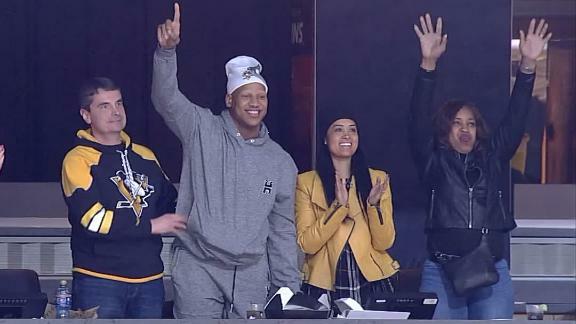 Ryan Shazier won't be on the field due to spinal stabilization surgery, but that won't stop him from remaining active in an unofficial role. Forget about his beef/no-beef with Mason Rudolph; Steelers quarterback Ben Roethlisberger looks renewed and ready for a late-30s resurgence. Though Shazier isn't playing in 2018, he'll most likely be putting in serious work. He could assume an informal coaching/motivational position.